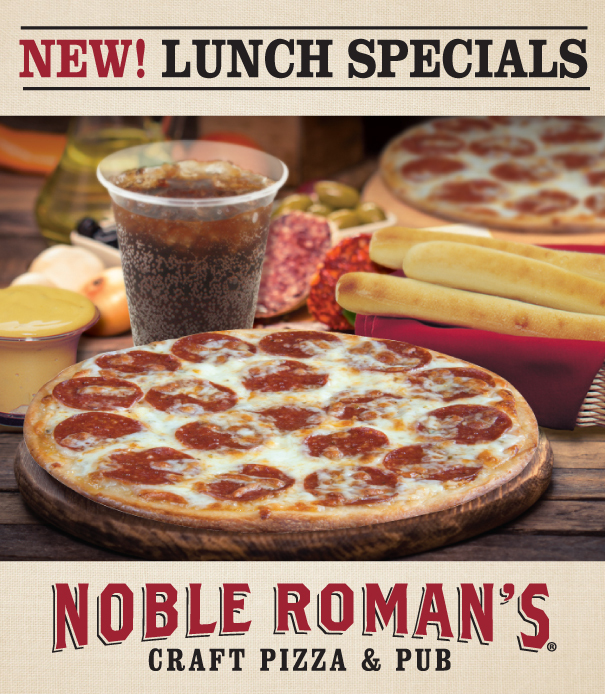 INDIANAPOLIS, IN / ACCESSWIRE / April 16, 2018 / Noble Roman's, Inc. (OTCQB: NROM), the Indianapolis based franchisor and operator of Noble Roman's Craft Pizza & Pub, today announced that it is now offering new daily lunch specials at each of its three company-operated Craft Pizza & Pub locations. The new lunch specials, available from open until 2:00 pm Monday through Saturday, are designed around a 3-tier pricing structure combining an entrée with either a side order of Noble Roman's famous breadsticks and dip or a side salad and dressing. Soft beverages, tea and draft, craft root beer may also be combined with these specials at a discount. The entry-level tier, known as the ''Quick Light Lunch,'' is being offered at $5 and includes breadsticks and dip with the customer's choice of a tossed salad or side Caesar salad and dressing. The $8 tier includes any individual, made-to-order pizza with the customer's choice of a side salad or breadsticks and dip. The $10 tier includes the customer's choice of a large salad, pasta or baked sub combined with either breadsticks and dip or a side salad. Guests may obtain a small additional discount when they add on a cold beverage to round out their meal. Noble Roman's Craft Pizza & Pub is intended to provide a fun, pleasant atmosphere serving pizza and other related menu items, all made fresh in customer view. In January, 2017, Noble Roman's opened its first company-owned Craft Pizza & Pub restaurant in Westfield, Indiana, a prosperous and growing community on the northwest side of Indianapolis. Since that time, two additional Craft Pizza & Pubs have been opened as company-owned restaurants with a fourth location now under development in Carmel, IN and expected to open approximately late May, 2018. Noble Roman's Craft Pizza & Pub is designed to harken back to the company's early history when it was known simply as ''Pizza Pub.'' Like then, and like the new full-service pizza concepts today, ordering takes place at the counter and food runners deliver orders to the dining room for dine-in guests. The company believes that Noble Roman's Craft Pizza & Pub features many enhancements over the current competitive landscape. The restaurant features two styles of hand-crafted, made-from-scratch pizzas with a selection of 40 different toppings, cheeses and sauces from which to choose. Beer and wine also are featured, with 16 different beers on tap including both national and local craft selections. Wines include 16 high quality, affordably priced options by the bottle or glass in a range of varietals. Beer and wine service is provided at the bar and throughout the dining room. The pizza offerings feature Noble Roman's traditional hand-crafted thinner crust as well as its signature deep-dish Sicilian crust. After extensive research and development, the system has been designed to enable fast cook times, with oven speeds running approximately 2.5 minutes for traditional pies and 5.75 minutes for Sicilian pies. Traditional pizza favorites such as pepperoni are options on the menu, but also offered is a selection of Craft Pizza & Pub original pizza creations like "Swims with the Fishes" and "Pizza Margherita". The menu also features a selection of contemporary and fresh, made-to-order salads and fresh-cooked pasta. The menu also includes baked subs, hand-sauced wings and a selection of desserts, as well as Noble Roman's famous Breadsticks with Spicy Cheese Sauce. Additional enhancements include a glass enclosed ''Dough Room'' where Noble Roman's Dough Masters hand make all pizza and breadstick dough from scratch in customer view. Also in the dining room is a ''Dusting & Drizzle Station'' where guests can customize their pizzas after they are baked with a variety of toppings and drizzles, such as rosemary-infused olive oil, honey and Italian spices. Kids and adults enjoy Noble Roman's self-serve root beer tap, which is also part of a special menu for customers 12 and younger. Throughout the dining room and the bar area there are many giant screen television monitors for sports and the nostalgic black and white shorts featured in Noble Roman's earlier days. The statements contained in this press release concerning the company's future revenues, profitability, financial resources, market demand and product development are forward-looking statements (as such term is defined in the Private Securities Litigation Reform Act of 1995) relating to the company that are based on the beliefs of the management of the company, as well as assumptions and estimates made by and information currently available to the company's management. The company's actual results in the future may differ materially from those projected in the forward-looking statements due to risks and uncertainties that exist in the company's operations and business environment, including, but not limited to, competitive factors and pricing pressures, non-renewal of franchise agreements, shifts in market demand, the success of new franchise programs, including the new Noble Roman's Craft Pizza & Pub format, the company's ability to successfully operate an increased number of company-owned restaurants, general economic conditions, changes in purchases of or demand for the company's products, licenses or franchises, the success or failure of individual franchisees and licensees, changes in prices or supplies of food ingredients and labor, and dependence on continued involvement of current management. Should one or more of these risks or uncertainties materialize, or should underlying assumptions or estimates prove incorrect, actual results may differ materially from those described herein as anticipated, believed, estimated, expected or intended. The company undertakes no obligations to update the information in this press release for subsequent events.